Why have so many people struggled to make a traditional investing model work for them? 1) You earn money through working a job. 2) Save as much as you can. 3) You then take your savings and invest it in the stock market. 4) From there you "watch that money grow" and then retire at age 65. The stock market has generally risen about 7% a year over the last couple decades, but with inflation that comes out to less than you would have expected maybe 3%. If this was the secret formula, why do 59% of Americans still feel very or moderately worried that they won't have enough money at retirement? To understand what we can do about the failing traditional investing model, we look to understanding why we accumulate financial capital. Humans don't intrinsically care about having a lot of financial capital. We want financial capital because we think it will provide us with the things we value such as access, privilege, choices, and experiences. In the process, we sometimes make choices that limit our own enjoyment (access, privilege, choices, and experiences) in order to make more money. The studies on happiness suggest that sudden increases in financial capital do absolutely nothing to increase your long-term sense of happiness. Long term happiness is about getting enough sleep, doing everyday things with friends and families, learning something new, and having a meaningful impact in your society. People who are engaged in self development are more aligned with happiness. 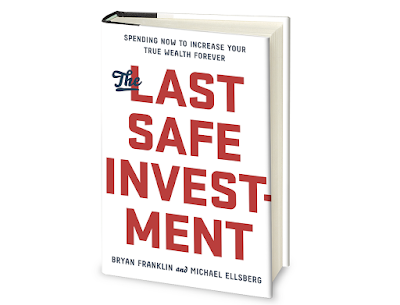 Bryan Franklin and Michael Ellsberg argue in their book The Last Safe Investment, that one thing the traditional investing plan neglects to consider is what you do with your human capital. If you start investing in your human capital, over time it will have a dramatic financial impact and the non-financial impact. Let's say you make $60,000 a year and you invest $5,000 of that over a year or two into a bunch of skill sets, like leadership, sales, persuasion and communication skills. With your soft skills that go very well with your technical skills, over a couple years you get a promotion. You'll be earning more money than before. That kind of return is very hard to achieve with considerable predictability in the stock market. What human capital skills should you invest in? Invest in super skills or skills that are valued in just about any industry, job or market condition. Super skills are basic human skills, such as how to communicate and leadership skills. The single most highly leveraged skill is public speaking. Take for example, two people who have worked ten plus years to get their PhDs whereby they've invested countless hours into their degrees. One of them is a horrible in front of a crowd and the other has spent a year practicing public speaking. Who would you bet your money on to succeed over time? Most people prefer to work in a meritocracy. Whereby, your merit of the work stands on its own. You can see each other's work for what it is that can be quite special, but that is not the world we live in. Between the results you create and the perception of that, the perception will yield the most acknowledgement. You'll need sales and marketing skills to demonstrate to your managers what you've accomplished. Most of us are in this vicious cycle of sacrificing time with friends, sleep, and the happiness to get money. Then with that money we try to get back friends, sleep, and happiness. The tribe is focused on the least by those who don't have it and treasured the most by those who have it. The tribe has a huge impact on your felt sense of wealth and financial wealth. It is a network of value based group of friends. When you have a tribe, you shares resources, values, and experiences. In addition, the networking of information about finding about new opportunities all happens within a tribe.